Note: Translations for this blog post will be posted as available over the next 2-3 weeks. Last update I mentioned that we were delaying the start of Wave 12 till Dec 1st in order to make a few announcements before we began. Today is that update, so let’s dive right in. The Exemplar program was originally envisioned as a peer to peer recognition system. It gives judges an opportunity to recognize the exceptional contributions of other judges in a public manner. Previously, similar recognitions happened only at conferences or during the debrief following a GP. Exemplar is a wonderful opportunity for the community to recognize what it values, and has reached nearly five thousand judges. Public recognitions are at the core of what Exemplar is. However, we have determined that the focus on foils often overshadows and detracts from the celebration of the awesome actions of our fellow judges. To that end, we are taking actions to increase the role of recognitions in Exemplar and de-emphasize the role of foils. This change was announced last update. The conference foil rotation and the Exemplar foil rotation are now a lot closer. In the past, conference foil packs followed behind Exemplar by six months, now they will follow behind by a few weeks. 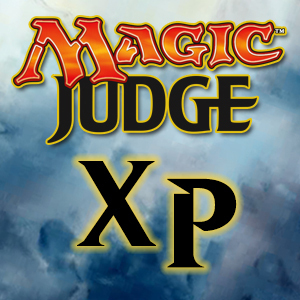 This means that new Judge foils are no longer only available through Exemplar. Regional and Mini-Conferences play an important role in the Judge Program and we are excited that this change will help encourage more Judges to attend. After talking to Rob and the other RCs, we will be introducing these personalized tokens to all Judges who receive an Exemplar Recognition. However, we are not content to only do what was done before. In addition to expanding the distribution of the tokens, we are also taking steps to make the art something truly special. Instead of using public domain art, each wave will have new custom art by a known Magic: The Gathering artist. The current artist we are working with is rk post. rk post is a staple at US GPs, and can pack an amazing amount of detail into a small rectangle. To make this art even more unique we will be doing something special each wave. A nomination will be chosen from a selected pool of recognitions (This pool is discussed in Change Three). The recipient of the chosen recognition will be designated the Exemplar ‘Vanguard’. This Vanguard will be collaborated with on the ‘art direction’ for the token used in the following Wave. 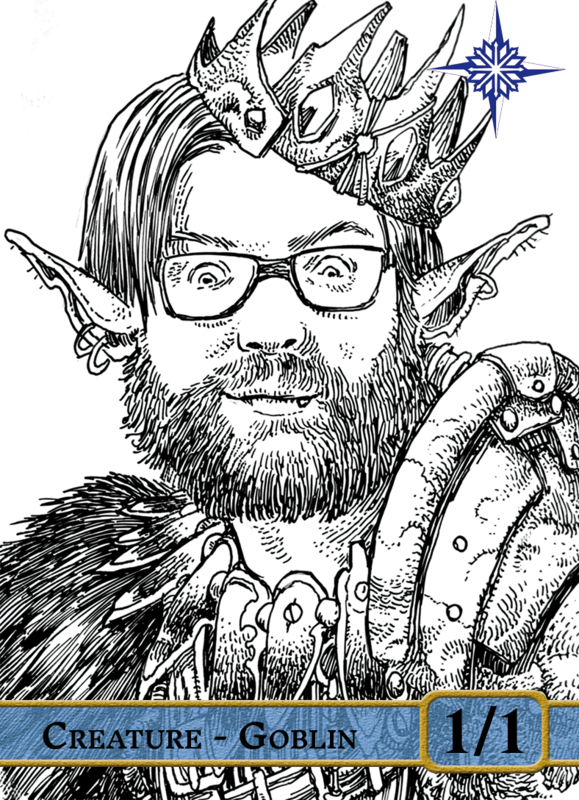 As an hypothetical example, if a recognition from Rob McKenzie was selected in Wave 12 to be the Vanguard, and he expressed interest in being a goblin on the token, the art for Wave 13 might end up looking something like the hipster goblin above. When the Exemplar program began, it was asserted very clearly that foils were not guaranteed. Over the last several waves, we have drifted from that assertion, and it has encouraged some undesirable behaviors, as too much emphasis is placed on foils, instead of the exceptional actions of Judges. Starting with Wave 12, we are re-asserting that foils are not guaranteed with Exemplar. We spent a good amount of time trying to decide how best to implement this re-assertion. We explored several options, but ultimately only one option met our goals. We will be introducing randomization elements into the foil allocation aspect of the Exemplar process. Based on these randomization elements, some number of nominations will be selected and “phased out” when determining foil allocations. The randomization elements are weighted towards judges that receive multiple nominations but will apply to other judges as well. What this means is just what it sounds like; with Wave 12, while recognitions will still be evaluated and accepted per our existing process, receiving one or more Exemplar recognitions does not necessarily mean any foils will be mailed to you. These selected recognitions will still be published on Judgeapps, and still have tokens produced and mailed. Additionally, all recognitions selected this way will go into the pool used to determine the ‘Vanguard’ for the next wave of tokens. To help alleviate any concerns of abuse or manipulation on the part of the Exemplar Team, the process is being implemented by the Judgeapps team, and the results will be software controlled. Additionally, each region independently will also be processed independently and equally. Furthermore, I have also asked Damian Hiller of the Conference Sphere to be the auditor of the randomization process. He is tasked with reporting any irregularities in its application to the PCs. Currently, when we review recognitions, they are either accepted or deferred. However, there is a small number of recognitions that have easily corrected errors. For example, it refers to the judge by the wrong name, or the author recognized the wrong judge. We typically contact the author and fix these recognitions during the review process. However, in order to get the tokens created, printed and mailed to RCs for distribution, they will need to be sent to the printer immediately after a wave ends. There will no longer be an opportunity to correct these recognitions, and they will instead be deferred. Tokens created for recognitions that ultimately are deferred will not be mailed out. Also, in order to ensure that nominations can fit on the tokens, we are adding a size restriction to Exemplar Recognitions. The limit changes based on what language you are writing the nomination in because some languages have wider characters than others. The good news is, that only 8 nominations in Wave 11 would have been over the limit, so you are unlikely to encounter it regardless of your language. A ‘proxy’ nomination is a term we use internally for a recognition submitted on behalf of someone else. 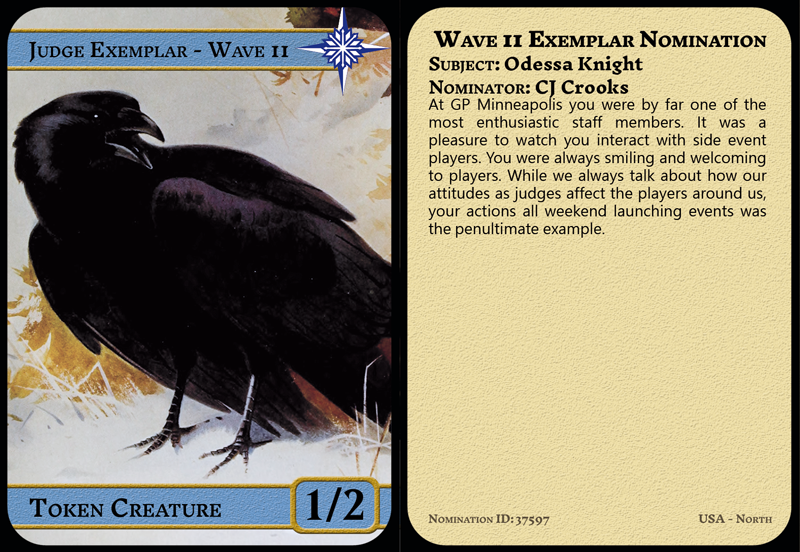 When Exemplar was started, RCs were specifically given slots that could be used on behalf of those that wanted to recognize a Judge, but could not. This is in keeping with their role and responsibilities as overseeing large regions and receiving input from multiple sources. However, over the last year we have seen a drastic increase in non-RC proxy recognitions. The few days before a Wave ends there is a flood of social media posts where people are trying to fill all their slots; effectively giving away their slot to someone else to use. There is a “use it or lose it” mentality and that unused slots are somehow a waste. We feel this mentality is related to and encouraged by the foils distributed by Exemplar, and has resulted in some problematic behavior. Starting with Wave 12, only RCs are allowed to make recognitions on behalf of another. All other ‘proxy’ nominations will be removed (as opposed to deferred) from the Wave during the review process. I want to clarify a few points here: This does not mean that you, as an L2+ judge, must personally observe everything you nominate a person for. If you are told about an awesome thing another judge does and you decide you want to nominate them for it, that’s exactly what Exemplar is for. You decided that you value the action based on what you heard, and you want to recognize that Judge in your own words. What we are prohibiting is, essentially, giving your recognition slot to another person to use, and the abdication of your ownership of that recognition. In short: You are responsible for each and every recognition you submit through Exemplar. If you are a judge who wishes to recognize a judge, and cannot, you have several options. The easiest is to brag about the judge online. The existence of Exemplar does not prohibit you from saying good things about another judge outside of Exemplar. If you feel uncomfortable doing this you can send a message to your Regional Coordinator to make them aware of the awesome things judges in their region are doing. RC’s love to hear about the good things judges in their regions do and they have an increased slot count for recognitions exactly for this purpose. A final option, if you aren’t already, is to consider pursuing L2. This seems a natural conclusion as you are demonstrating both the involvement in the program and scope of interactions that we value in our L2 members. I think those are big enough announcements for today. I know some of these changes will not be popular. Changing how foils were distributed after eleven waves was not an easy decision, but ultimately it was necessary to support the overall health and continuation of the Exemplar Program. We are also extremely grateful to Rob McKenzie for bringing an idea from his region to the larger Judge Program. Being able to provide judges with a physical printing of their accomplishments they can pull out during a game and use as a conversation topic with another player is extremely exciting for us. I personally am looking forward to the seeing RK Post turn our fellow judges into Zombies in a crypt or Merfolk swimming upstream or hapless pirates on a Treasure Token. As always, constructive feedback is welcome, and if you have any questions or concerns or comments, you can email us at exemplarprogram@gmail.com or post to the forum thread created for this blog post.